Killer Characters: Can't a Guy Go to a Tea Parlour? Can't a Guy Go to a Tea Parlour? I was pretty embarrassed to hear that I'm a hot topic of conversation around town. 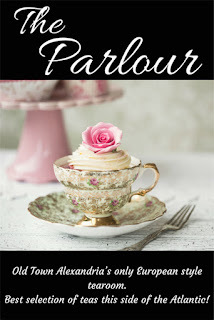 And all because I like The Parlour, the new tearoom in Old Town. You see, I go to The Parlour for a few very legitimate reasons. In the first place, who ever said that ladies have dibs on tea? I did some tours in Iraq and now I run my own company training people to do search and rescue. Not with dogs, even though I miss having one. I assist municipalities in coming up with contingency plans for major emergencies, and I train their personnel. So I don't have any doubts about my own masculinity. Where does it say that guys have to eat hot dogs and drink beer at greasy spoon type joints? Can't a guy enjoy great pastries and tea, too? There is another reason that I like The Parlour. I admit that I'm sweet on Callie Evans, one of the employees. There's something about Callie. I guess it's because she reminds me of the girls I grew up with. I might live in metropolitan Washington, DC but I'm still a country guy at heart. Give me a chair on the back porch and a dog by my side, and I'd be perfectly content watching fireflies and stars at night. Callie's like that, too. We'd just as soon pass up the art galleries and the bars to enjoy nature and not a neighbor anywhere in sight. Some of the regular ladies like gossiping about me, though. It's like having my mom watch me. How's a guy supposed to get friendly with a girl when they're watching? But even if Callie didn't work at the Parlour, I would be here every day for my current obsession-Bacon Cheddar Cheese Scones with Maple Bourbon Butter. Who knew scones could be savory? Callie gave me permission to share the recipe with you. 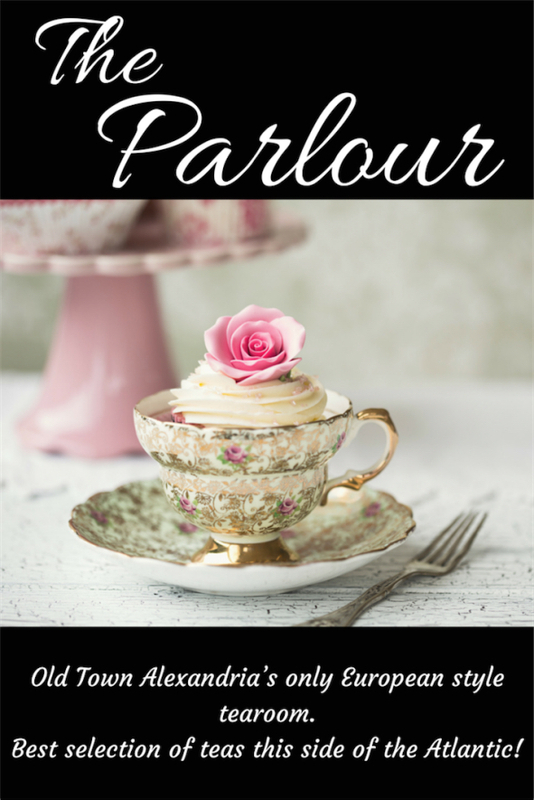 I'm not much of a baker, so I stop by The Parlour for them. How about you? Do you bake? There's no other reason a guy like me would hang around The Parlour. Is there? Place the pastry blade into a food processor and add the flour, baking powder, and salt. Pulse twice. Cut the butter into cubes. Add to the flour, along with the cheese, and pulse until combined and the butter is barely visible anymore. In a large bowl, whisk together the egg, cream, and mustard. Turn out the flour mixture on top of it and mix gently with a large serving spoon two or three times. Add the bacon and mix until large clumps begin to take shape. Sprinkle flour on a cutting board and dust your hands with flour. Turn the dough onto the cutting board and knead 8-10 times, adding just a sprinkle of flour if necessary. Pat the dough into a 9-inch cake pan. Turn it out onto the parchment paper and cut the round into 8 equal pieces with a very sharp knife. It’s best to press the knife into the dough instead of dragging it through the dough. Slide a knife or thin spatula under each slice and pull away from the center slightly to separate them. (They can be frozen at this point if you don't need them all.) Bake 20-22 minutes. For the Cozy Up To Summer Giveaway, Krista said I could offer you a choice of books! Leave a comment with your email address, please, so she can contact you if you win. Which book would you like to read? Psst. Don't tell where you heard this, but there's a SUPER SPECIAL GIVEAWAY at KillerCharacters.com tomorrow! Be sure to come back! I would love to try the Diva series, it's new to me! Thanks for the chance! I enjoy hearing from different character's perspective. That's right, no law that says men can't enjoy tea. Thanks for the giveaway. The savory scones sound yummy! I would a chance to win The Diva Serves High Tea. Thanks for the chance to win! I loved the recipe. I am going to try them. I have never read these and would start with the first one. Great recipe!! I haven't read this series yet but it's one I would love to start soon. I would like to start with the first one. I love your books and I would like The Diva Serves High Tea. 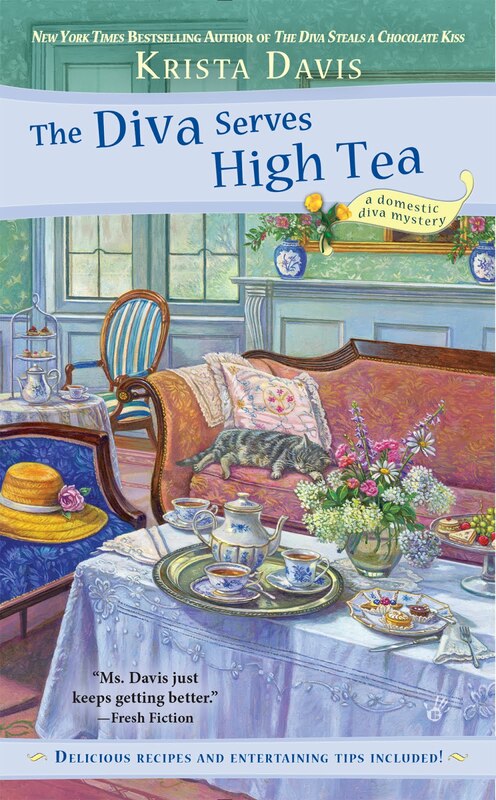 I would love to win a copy of The Diva Serves High Tea. Thank you for this opportunity. Thanks for the chance to win a book. I've never read these so I would want to start with book one. TY for the chance. Love the scone recipe, savory scones are my favorite. Would love The Diva Serves High Tea. Thanks for the chance, my email is mjbookaddict@gmail.com. Thanks for a chance to win one of your books. I love Krista Davis. I would enjoy winning and reading The Diva Serves High Tea. I love reading new series! Thanks for the opportunity. This would be a difficult decision! MURDER MOST HOWL would be my first pick :) thank you for gifting one of us! Murder Most Howl would be my pick. Thanks for the chance to win. Jlsbookclub (at) nc (dot) rr (dot) com. The diva serves high tea. jpieklik@twcny.rr.com. Thanks for the chance to win. I would love The Diva Steals a Chocolate Kiss. That's where I'm up to in the series. I've never had a scone but they sound wonderful! The Diva Serves High Tea is my choice. Thank you. As a tea lover, I definitely want The Diva Serves High Tea. Thanks for this opportunity! Of all the books you've listed in the giveaway the only one I don't own is Murder She Barked. I'd love to add it to my Krista Davis collection. Would love to read this book! Need to catch up on this series. Those scones sounds delicious! If I win I would like Murder She Barked. Like dogs so I'd pick Murder She Barks. Murder most Howl. So difficult to choose. Thanks. I'm a HUGE fan of the Diva series - I own them all! Paws & Claws is a favorite as well. You have a talent for painting a picture with words Ms. Davis! I'll message my email address to you on Facebook. Thanks for the opportunity to win! Ohhh, that recipe sounds divine! I Love bacon, and there are lots of places near me to get fresh maple syrup...well during season. My best tea friends happen to be men-so nothing wrong with that! Enjoy your tea...and bacon makes it even manlier! I love all the books, but I think I'm behind and need Murder Most Howl! Thanks for the chance! I LOVE this series! Krista Davis rocks it! I love these books. Would like to read Diva Steals |A Chocolate Kiss. Don't know how I missed that one. Congratulations, Linda May! You are our winner! I love both series! If I am the lucky one, I would like Murder Most Howl. Thanks for the giveaway. I really love this series. I would really like to read "The Diva Steals A Chocolate Kiss". I don't have that book in the series yet. Great recipe for savory scones, I like scones but have never tried making them. 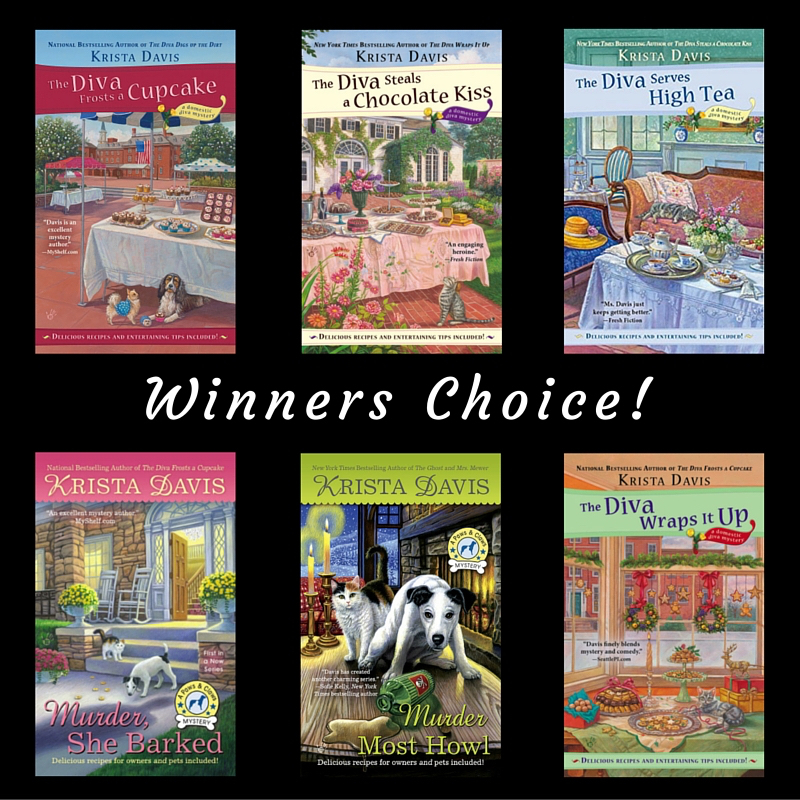 love this series would love diva steals a chocolate kiss..my email is. I, too, am a domestic diva...says my husband! Sunday brunch menu is set with these scones, and I'd love to get another book to spend my days enjoying the adventure. Thanks, Krista! I loved THE DIVA SERVES HIGH TEA. It was great fun. I'd like to read THE DIVA STEALS A CHOCOLATE KISS. I'd love to have all of these books but if I have to pick one I'll pick The Diva Steals a Chocolate Kiss. Thank you for the giveaway! I love this series. I'm about to start The Diva Wraps it up. Every book has been great. Thanks for the chance! I love the scones Bisquit recipe reminds me of red lobster chesee Bisquit recipe. Would love to have any of them. I would love the chance to read Murder She Barked. Thsnk you for hosting on your blog. Her books are always great to read. Love cozy mystery. Thanks for having such a good giveaway. I would love to read "The Diva Serves High Tea"
all of 'em! esp murder she barked! Thanks for the chance! Can't wait to try the scone recipe. Love savory scones!! Sherry Smith is having trouble entering. This is her official entry. I would love to read The Diva Wraps It Up. I love Christmas books of every kind and I especially enjoy the Diva series. Thank you for the chance to win a book! What a great post! Those scones sound fantastic. I would love to win The Diva Serves High Tea. The recipe sounds delicious. No wonder you like hanging out there. Love your books. I can see why a guy would have around a Tea Shop. If nothing else those scones sound to die for...please enter me in the Contest. I would like to read Murder She Barked..
Well, I'd walk a mile for maple bourbon butter, and what better to accompany my box of mystery scones I got today? Yum! But seriously, that back porch and fireflies sounds really nice, and I'm not even a country girl. I haven't read The Ghost and Mrs. Mewer so I would like that one if I would win. Thanks! I think it's fine for a guy to go to a tea parlor! And those scones sound delicious!!! I once had a jalepeno and cheddar scone and it was great. If I win I would love The Diva Frosts a Cupcake. Thank you so much for the chance to win!!! I'd like to start at the beginning thank you. I would love to win a copy of the Diva serves High Tea.. Thanks so much for the recipe and chance to win.. Made it with 12 minutes to go in the day! I would love The Diva Serves High Tea! Thanks for the chance! I didn't have any bacon when I made these scones and I substituted some chopped up deli ham I had in the fridge and they were really great for a weekend lunch with a salad. I have been making scones a lot for weekend breakfasts and was glad to find a savory recipe to play with. What a great giveaway!! Pamela dot fry dot priest at gmail dot com Thank you! Boy, do those scones sound good! I would love The Divas serve high tea. Thanks for the chance! I might pick Murder Most Howl since I don't own any books in this series. Much Ado About Muffin sounds great! As do all the others!